← My first tropical disease! Dengue 1.0. Everyone said that trying to cycle in KL was for the insane. The drivers are crazy, the roads are in bad condition and you’ll get run over. I ventured out onto some relatively quiet streets but I felt hemmed in by highways and more highways and ramps and didn’t dare to get onto the roads. Then I slowly started making cycling connections on Facebook and found myself on 5 or 6 KL and Malaysian cycling Facebook-groups. My first encounter with really riding around town was with the guys from the Roadlink bike shop in Bangsar. I joined them for a Sunday morning ride through the heart of KL. We visited Dataran Merdeka, Bukit Tunku, Hartamas and Bukit Damansara. You could ride through town after all! But it felt safer in a group! Then one day there was a story in the local newspaper about a guy who was making a map of cycling routes in KL. I couldn’t wait to call and went over to meet him. Jeff gave me several blank copies of his map and asked me to fill in where I ride. Unfortunately, his map didn’t extend to where I live and I was still timid to ride much around town. And then he started with his survey rides. I have joined several of the Saturday morning rides. Usually there are 10-20 cyclists who join and ride around checking and verifying routes that Jeff thinks might be good for cyclists. This week, I did my first post-dengue ride around Sentul and Chow Kit. We rode on busy roads, crossed railroad tracks, circled river islands, saw an otter in the river (!!!!) and had a great time. I can’t wait to see the final product of Jeff‘s efforts! 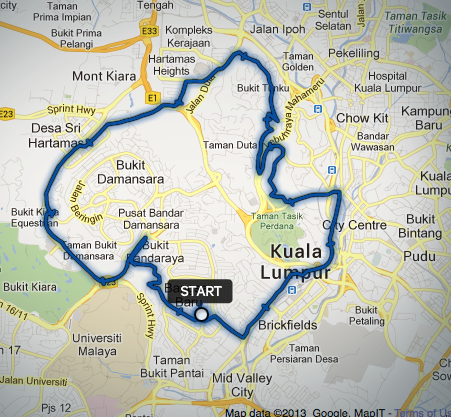 This entry was posted in Cycling and tagged cycling, Kuala Lumpur, mapping. Bookmark the permalink.